Bacteria and fungi occur in all environments. In humans, these lifeforms can be harmless passengers, participate in beneficial biological processes, or cause disease. Bacterial and fungal infections affect people of all ages and range from minor to potentially life-threatening. Bacteria and fungi have similarities and differences that influence their disease-causing potential and treatment. Cells are the simplest units of life, and are categorized into two main groups. Bacteria are prokaryotes, one-celled organisms that lack a structure called a nucleus, a membrane-encased collection of genetic material. Although bacteria are unicellular, they often collect in chains or clusters. Fungi are eukaryotes. Fungal cells include a well-defined nucleus as well as other distinct structures with varied functions. Fungi occur in unicellular and multicellular forms, including mushrooms, lichens, algae, yeast and mold. Most medically relevant fungi exist as unicellular yeasts and molds. Fungi are generally larger than bacteria and utilize more complex biologic processes. With rare exception, disease-causing bacteria possess a rigid cell wall surrounding their cell membrane. Most also have a capsule or slime layer that encases the cell wall. Fungi also have cell walls. However, the composition of bacterial and fungal cell walls differ. Bacterial cell walls consist primarily of peptidoglycan, a compound made of a backbone of sugar molecules with attached short chains of amino acids. Fungal cell walls contain primarily polysaccharides, such as chitin, beta-glucan and mannan. Polysaccharides are large chemicals consisting of interconnected sugar molecules. Amino acids and proteins are not major constituents of fungal cell walls. The cell walls of bacteria and fungi protect them from the environment and give them shape, among other functions. However, the chemical and structural differences between their cell walls is one reason antibiotic medicines that are effective against bacteria are ineffective against fungi, and vice versa. As unicellular organisms, bacterial cells do not grow per se. However, they can multiply very rapidly. Disease-causing bacteria multiply by an asexual process called binary fission, in which the parent bacterium divides in two. Most pathogenic bacteria, meaning those that cause disease, can double in number within 15 to 60 minutes. This explains why serious bacterial infections, such as meningococcal meningitis or a bloodstream infection, usually progress very quickly. Fungal growth and replication is typically slower, and often more complex and diverse than that seen with bacteria. Unicellular yeast, such as those responsible for thrush, usually multiply by an asexual process called budding. But they are also capable of sexual reproduction. Pathogenic molds, such as Aspergillus, can grow by branching and elongation, and reproduce by sexual or asexual processes. The slower growth and replication of fungi frequently necessitates longer treatment for a fungal infection, compared to a bacterial infection. Both bacteria and fungi can cause human infections, but serious bacterial diseases occur more frequently than serious fungal infections. Common types of relatively minor fungal infections include athlete's foot, jock itch, ringworm of the nails, vaginal yeast infections and oral thrush. Examples of more serious, invasive fungal infections include Pneumocystis pneumonia, histoplasmosis and coccidioidomycosis, also known as valley fever. People with a weakened immune system are more susceptible to serious fungal infections than are those with a normal immune system. Superficial bacterial infections often occur after minor cuts and scrapes. Deeper skin infections can cause abscesses or cellulitis. When bacteria evade the body's normal defenses, they can cause a wide range of infections. Common examples include urinary tract infections and strep throat. More serious infections most frequently caused by bacteria include pneumonia, bloodstream infections and bone infections. Many types of pathogenic bacteria produce toxins that cause some of their ill effects. Toxin production is uncommon among disease-causing fungi. 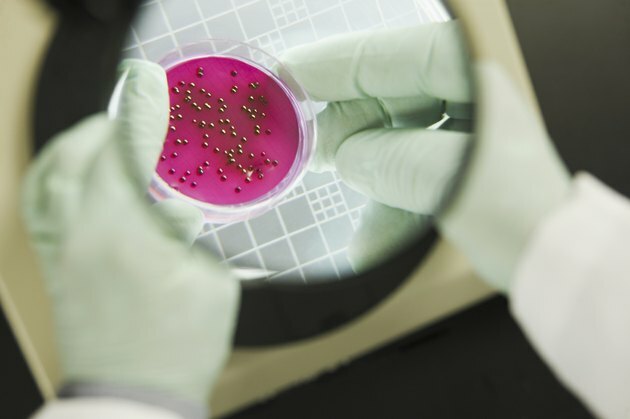 Because of the structural and biological differences between bacteria and fungi, treatment for infections caused by these organisms also differs. Superficial fungal infections, such as jock itch or a vaginal yeast infection, usually clear up with over-the-counter topical antifungal medicines. Deeper or more severe fungal infections typically require oral or intravenous antifungal medication. The duration of therapy may last several months for resistant or difficult-to-treat fungal infections. Antibacterial medicines are the cornerstone of treatment for bacterial infections. The choice of antibiotic and the route of administration depends on the site of the infection, the severity of illness, and the type of bacteria involved. However, it's important not to take antibacterial medicines for illnesses unlikely to be caused by bacteria, such as a head or chest cold. Overuse of antibacterial medicines promotes resistance to these drugs.